' A Break in the Nuclear Waste Impasse? A Break in the Nuclear Waste Impasse? Spent nuclear fuel has continued to accumulate at sites across the nation, paralyzed by a government deadlock on a nuclear waste management strategy formally established 35 years ago. Can recent developments offer a breakthrough? February marked 20 years since the U.S. Department of Energy (DOE) defaulted on a “standard contract” with the nation’s reactor operators to begin disposing of highly radioactive spent nuclear fuel (SNF) as required by the Nuclear Waste Policy Act (NWPA) of 1982. Despite a series of recent developments that could revive the Yucca Mountain deep geologic repository in Nevada, making it the final destination for the nation’s spent fuel, as required by amendments to NWPA in 1987, a long-standing political deadlock has left the U.S. with one option that has nearly every stakeholder attached to the nuclear power industry despondent—to wait. But waiting is a treacherous game. 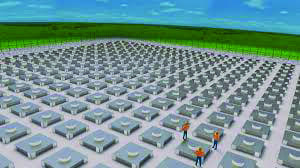 About 80,150 metric tons heavy metal (MTHM) of SNF—fuel withdrawn from a nuclear reactor following irradiation, which is referred to as “used” fuel by the nuclear industry because it contains potentially reusable uranium and plutonium—is in temporary storage at 75 reactor sites scattered across 33 states, according to the DOE’s Sandia National Laboratories. 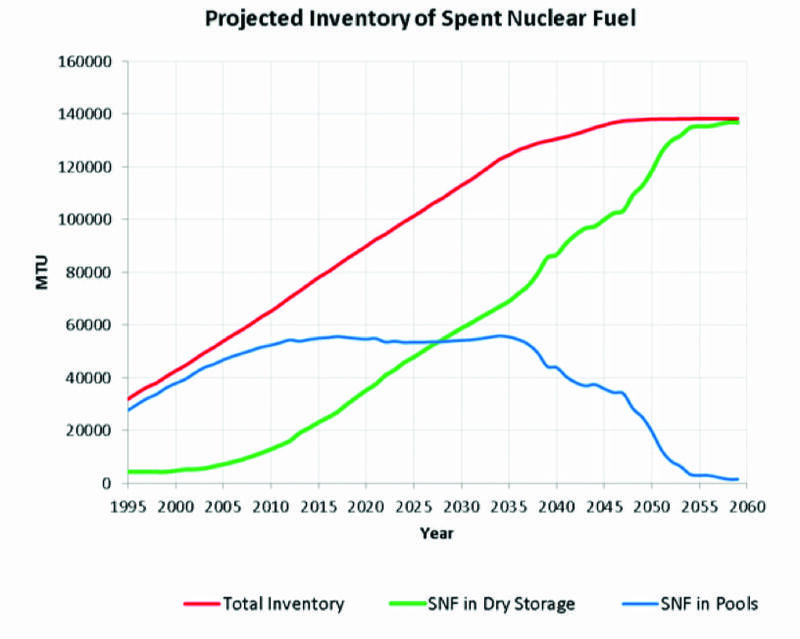 Nearly a third of that SNF—25,400 MTHM—is in dry storage in about 2,080 cask or canister systems, and the balance is in spent fuel pools, mainly at reactors, or otherwise stranded at independent spent fuel storage installations (ISFSIs) if the reactor has been shut down. Another 2,200 MTHM of SNF is generated nationwide each year. Because U.S. pools have reached capacity limits, about 160 new dry storage canisters are loaded each year. Sandia presents the problem starkly: If the Nuclear Regulatory Commission (NRC) grants all license renewals requested by the bulk of the nation’s 99-reactor fleet, and assuming no new reactors will be built and no action is taken on long-term disposal, the nation’s projected SNF inventory will surge unrelentingly upward (Figure 1)—and with it, risks for health, security, and the environment. As crucially, the taxpayers’ burden for the federal government’s inaction on the nuclear waste impasse is getting ever heavier. Getting the project started hasn’t been cheap: From fiscal year 1983 to the DOE’s license submittal for Yucca Mountain to the NRC in 2008, the DOE spent nearly $15 billion (in 2010 dollars) to investigate developing a repository. The Government Accountability Office (GAO) says that from fiscal year 2009 to fiscal year 2016, the agency received an additional $1.4 billion in appropriations for nuclear waste management. Meanwhile, the Nuclear Waste Fund—a U.S. Treasury account collected via a fee charged to ratepayers over 30 years—today holds a balance of about $37 billion. Mostly unused, owing to paralysis of the Yucca Mountain project, it continues to accumulate interest of about $1.7 billion a year from investments in Treasury securities. And worse, because the DOE entered into NWPA-required contracts with every U.S. nuclear generator to dispose of SNF no later than January 1998 in return for the fee, nuclear generators have recovered costs for SNF storage and management by suing the DOE. The first settlement the Department of Justice reached under such litigation in July 2000 allowed PECO Energy (now part of Exelon) to keep up to $80 million in nuclear waste fee revenues for 10 years. However, other generators sued the DOE to block the settlement, and the Eleventh Circuit ultimately ruled in September 2002 that compensation for missing the disposal deadline would have to come from general revenues other than the Nuclear Waste Fund. Those nuclear waste payments now come out of the Treasury’s Judgement Fund (see sidebar: “The Judgement Fund: The Taxpayers’ Nuclear Waste Burden”), a permanent account that requires no appropriations and is used to cover damage claims against the U.S. government. An audit of the Department of Energy’s (DOE’s) Fiscal Year 2016 Nuclear Waste Fund financial statement, conducted by accounting firm KPMG for the DOE Office of Inspector General and released in December 2016, showed 38 lawsuits had been settled as a result of the DOE’s partial breach of contract ensuing from inaction on Yucca Mountain, and 41 cases were resolved by final unappealable judgements. As of September 2016, the Treasury’s Judgement Fund paid $4.4 billion for delay damages and $1.7 billion from final court judgments for a total of $6.1 billion. The DOE said the government’s ultimate liability—if it manages to settle with all 45 utilities under contract—is likely to be about $30.8 billon. Industry estimates suggest liabilities could soar to as high as $50 billion. The Nuclear Energy Institute (NEI), a group that represents the bulk of U.S. nuclear generators, said that damage payments average $2.2 million per day—or about $800 million per year. “Whenever the government loses a lawsuit, money just magically comes out of the Judgement Fund,” Rod McCullum, senior director of the Nuclear Energy Institute’s (NEI’s) Used Fuel and Decommissioning arm, told POWER in February. And the Judgement Fund is just the tip of the iceberg. There is a mounting bill that Anthony J. O’Donnell, a commissioner at the Maryland Public Service Commission who also serves as chair of the Subcommittee on Nuclear Issues–Waste Disposal at the National Association of Regulatory Utility Commissioners (NARUC), told a House Interior, Energy, and Environment subcommittee in September 2017 has “nothing to show for it.” Ratepayers, who already funded the one mill (one tenth of a cent) per kilowatt-hour fee to bloat the Nuclear Waste Fund for decades until the D.C. Circuit suspended fee collection in 2013, also paid for the original waste storage at facilities scattered across the nation (Figure 2), as well as to rerack or consolidate used fuel pools, and for onsite, out-of-pool dry cask storage. For the nuclear power industry, which is reimbursed for storing SNF onsite, the stalemate is still proving costly in terms of lost opportunity, McCullum said. “The members are tired,” he said. One consideration is that a utility must divert resources, including manpower, equipment, and capital, to deal with SNF when they could be used instead to make a plant more efficient in an increasingly competitive marketplace. At the same time, “You’ve got a long-term situation where you can decommission a plant, but you are still maintaining a nuclear stake,” he said. Another consideration, as Rita Sipe, manager of Duke Energy’s Nuclear Fleet Communications, in February told POWER, is that used fuel pools and dry cask storage sites, which Duke has located at five of the company’s six operating nuclear plants, require operations and maintenance (see sidebar, “The Dry Cask Boom”). 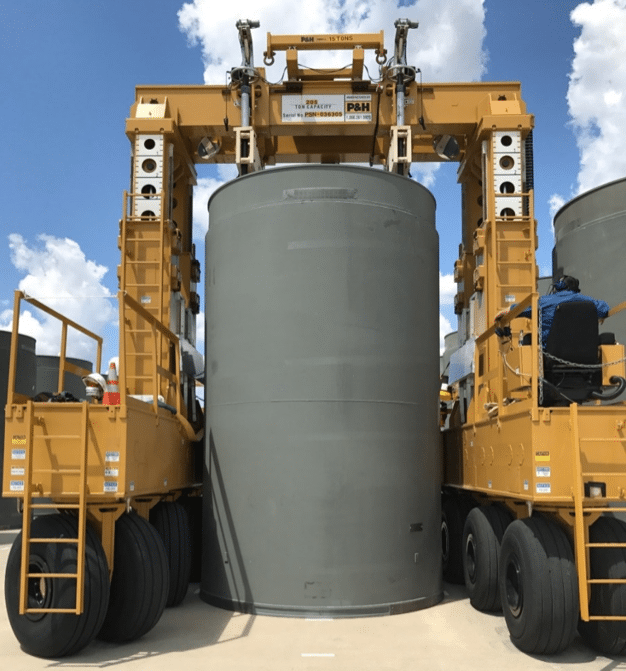 “We don’t split fuel storage functions out separately—they are part of plant systems, components, and structures, and are maintained by skilled and experienced employees in the same way other plant equipment is maintained,” she said. However, “on-site storage is not a permanent solution,” she added, noting that the company has urged the government to resume work at Yucca Mountain to fulfill its statutory responsibilities. Though frustrating to nuclear plant owners, states, and lawmakers, the spent nuclear fuel disposal impasse has a clear beneficiary: production and service markets for dry cask storage. RnR Market Research in July 2016 forecast, for example, that the U.S. dry cask market, valued at $604.5 million in 2015, is set to grow to more than $1 billion by 2020. (For more, see “Dry Cask Storage Booming for Spent Nuclear Fuel,” in POWER’s February 2015 issue). That’s a marked gain for an industry that got its start as a temporary solution. 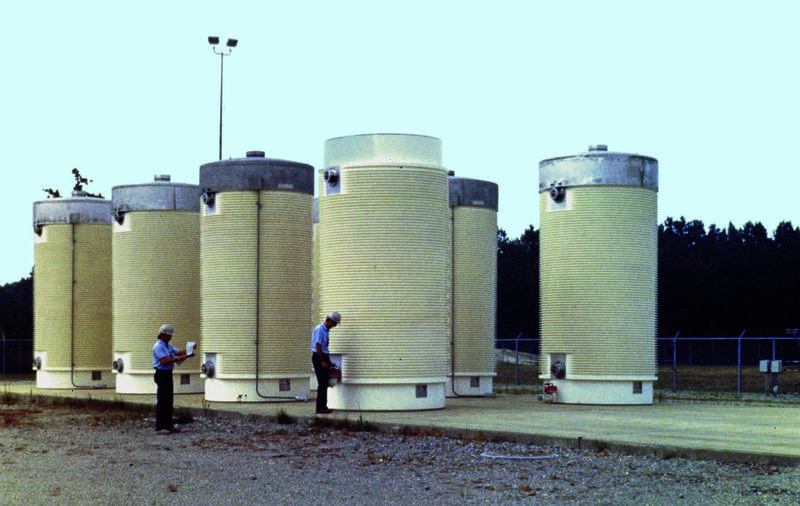 In the early 1980s, as the political imbroglio concerning civilian reprocessing and a final geologic repository was playing out, spent fuel pools in nuclear plants nationwide—designed to hold fuel from one to two decades of normal operation—began to fill up, forcing them to retrofit pools with storage racks equipped with neutron absorbers so more fuel assembles could be packed into the pools without going critical. The Energy Department and the Electric Power Research Institute (EPRI) in the early 1980s set about researching alternatives. A technology initially developed in Germany to move fuel assemblies into dry cask storage systems eventually prevailed, following a successful joint demonstration project with Virginia Electric Power Co. In 1986, the Nuclear Regulatory Commission (NRC) licensed the first dry storage installation at the Surry Nuclear Power Plant in Virginia, and more nuclear plant owners followed suit, armed with a 20-year license, along with expectations that Yucca Mountain would soon begin operations. By the late 1990s, it was clear that licenses would need to be extended. Following a joint study by EPRI, the Department of Energy, and the NRC that examined degradation of 15-year-old fuel stored in a dry cask, the NRC began approving 40-year license extensions. After the Obama administration effectively paralyzed the much-delayed Yucca Mountain project in 2009, the NRC studied and determined in 2014 that spent fuel could be safely stored for up to 60 years in spent fuel pools and indefinitely in dry casks—assuming the casks could be replaced once every 100 years and that utilities could implement aging management programs to maintain cask safety. In mid-2017, it added to its list of approved spent fuel storage casks (using a direct final rule procedure) TN America’s NUHOMS EOS Dry Spent Fuel Storage System. Today, the NRC has licensed about 15 different dry cask storage designs. Most use metal cask, vault, concrete module, and other dry storage methods. The NRC closely oversees inspections, requiring cask designers to assure cask quality and licensees to ensure storage facilities meets regulations. Inspections of canister surfaces and welds are conducted using nondestructive examination (NDE)—a set of techniques used for decades—that typically involves visual, ultrasonic, eddy current, and guided wave examinations. According to EPRI, inspecting the inside of casks is far more complicated. Casks weren’t originally designed to be inspected, it noted. Cask interior inspections require getting inspection equipment inside the overpack to the canister surface, which is at most a few inches wide. In fact, EPRI researchers didn’t make their first on-site cask interior inspections until 2014 when they examined two canisters stored at Exelon’s Calvert Cliffs Nuclear Power Plant using visual scans, temperature measurements, and surface samples. The NRC says evolving robotics are helping facilitate NDE techniques inside casks, noting that EPRI and cask manufacturers have successfully demonstrated robotic inspection at different reactor sites. Consensus is that the unsurmountable effort to implement any solid policy relating to long-term management of nuclear waste in the U.S. is centered around Yucca Mountain (Figure 3). The problem comes mainly from the State of Nevada’s fierce opposition to the planned repository on the grounds that it is unsafe and vulnerable to potential volcanic activity, earthquakes, water infiltration, underground flooding, and nuclear chain reactions. The state’s contentions were at the heart of the Obama administration’s abrupt policy decision to scrap the project. In a move designed to cement the repository’s fate and entomb any previous efforts to build it, the Obama administration in March 2010 took the step of withdrawing the Bush administration’s 2008-submitted NRC license application for Yucca Mountain “with prejudice,” meaning the application could not be resubmitted. But the NRC’s Atomic Safety and Licensing Board (ASLB) in June 2010 denied the DOE’s license withdrawal motion, ruling that the NWPA prohibits the DOE from withdrawing the application until the NRC determines whether the repository is acceptable. While NRC commissioners sustained the ASLB decision in a tie vote in September 2011, the NRC stalled further consideration of the application, citing “budgetary limitations.” That prompted intervention by the D.C. Circuit, which ruled in August 2013 that the commission must continue work on the Yucca Mountain application as along as funding is available. Intent on forging a strategy that didn’t include Yucca Mountain, the Obama administration also established the Blue Ribbon Commission on America’s Nuclear Future (BRC), a nine-member panel of nongovernmental experts tasked with development of alternative waste disposal strategies. At the end of the two-year deliberations period, the BRC recommended that a new “single-purpose organization” be given the authority and resources to begin developing—using a “consent-based approach”—one or more nuclear waste repositories and consolidated storage facilities. In response to the report, the DOE in January 2013 quietly issued—without as much as a press release—an outline for a new nuclear waste program. Essentially, it foresaw a pilot interim spent fuel storage facility opened by 2021, a larger-scale storage facility (possibly an expansion of the pilot) by 2025, and a geologic disposal facility by 2048—50 years after the initial planned opening of Yucca Mountain. The courts, too, have been pivotal in shaping the repository’s fate. In 2013, the D.C. Circuit ended a dispute that had been stewing since 2010, dealing a landmark victory to NARUC and industry group NEI, which sued the DOE for collecting what they charged were “legally defective” fees for nuclear waste disposal. Ruling that the fee was unlawful in 2012, the court gave the DOE six months to conduct a reevaluation of the Nuclear Waste Fund. But after the DOE responded that the fees were necessary because the administration and Congress intended to pursue a new nuclear waste strategy—and the agency itself had unveiled a phased, consent-based approach to siting and implementing a nuclear waste management and disposal system—Senior Circuit Judge Lawrence Silberman, in an often sardonic seven-page decision, said that the fee should change to zero until the Energy Secretary chose to comply with the NWPA. The BRC’s entire effort was thrown amok again more recently by the Trump administration. Stating a priority to restart Yucca Mountain, President Trump in May 2017 submitted a congressional budget request for FY2018 with more dollars for both the DOE and NRC. However, in July the Senate Appropriations Committee’s FY2018 Energy and Water Development Appropriations bill provided no funding for Yucca Mountain. It instead authorized the DOE to develop consent-based pilot interim storage facilities to handle fuel from closed reactors currently stored at ISFSIs. This February, the Trump administration again requested funds to revive licensing as part of a larger $4.4 trillion budget blueprint for FY2019, which runs from October 2018 to September 2019. In the backdrop, the nuclear power industry is driving a campaign to draw attention to H.R. 3053, a bill introduced by House Republican John Shimkus (Ill.) in June 2017. Called the Nuclear Waste Policy Amendments Act of 2017, the bill cleared the House Energy and Commerce Committee in October 2017 and seeks to satisfy a major licensing condition by giving the DOE full control of the public land. It also expands the capacity limit on the Yucca Mountain repository from 70,000 to 110,000 metric tons, authorizes the DOE to store SNF at an NRC-licensed interim storage facility owned by a nonfederal entity, and provides mandatory funding for specific stages of repository development. While the Trump administration’s recent budget request alone may not move H.R. 3053 to the floor, both are “reassuring” developments that could resolve political and financial hurdles blockading Yucca Mountain development, said Katrina McMurrian, executive director of the Nuclear Waste Strategy Coalition (NWSC), an entity whose membership includes state utility commissions, state consumer advocates, state energy officials, and owners of operating and shutdown reactors. For McMurrian, passage of H.R. 3053 will especially be key. “For DOE and NRC to proceed with Yucca Mountain license activities in accordance with existing law, the federal government must have a more reliable funding source than the annual appropriations process usually affords,” she said. “Electric customers have paid billions into the federal Nuclear Waste Fund, and HR 3053, if passed, would provide access to a portion of the fund balance over time for critical nuclear waste management program needs,” she told POWER in February. 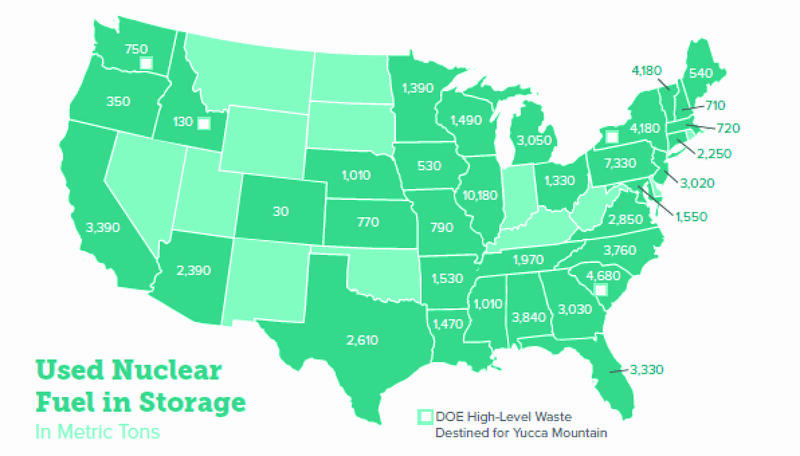 Perhaps no stakeholder has agonized over the nuclear waste impasse as much as the DOE. When the agency delivered (by truck) its 17-volume, 8,600-page application for Yucca Mountain to the NRC in June 2008, it projected the repository could begin receiving waste in 2020—22 years later than the 1998 goal established by the NWPA. At the time, the agency celebrated the milestone with significant fanfare because for the first time since Congress enacted the NWPA, the focus shifted away from the DOE and to the NRC. A decade has now dissipated without any substantial progress. For career DOE employees, which had to stand by the Obama administration’s actions to terminate the program, and then endure the BRC’s consideration of a fresh nuclear waste management strategy beyond Yucca Mountain, a sense of futility is pervading. Despite Trump’s announced commitment to restart Yucca Mountain, and despite multiple hearings in Congress on the stream of proposed actions—including H.R. 3053—despite repeated slogs through the appropriations process, no funding has come through to resume the project. “So, where we are today is where we’ve been since 2000,” a DOE official told POWER. Even if Trump’s FY2019 budget makes it through appropriations, the $120 million requested is barely a start for the DOE. Though the DOE hasn’t conducted a recent “bottom-up” estimate, agency officials noted a much larger annual figure will be needed to fully participate in the licensing proceeding. As an example, in 2010—the last year that the DOE’s Office of Civilian Radioactive Waste Management got an appropriation to fully participate in the repository licensing—the appropriation was about $198 million. “The licensing proceeding itself is a large complex legal proceeding,” requiring a “large number of technical experts in a variety of technical disciplines, scientists, engineers, attorneys,” a DOE official explained to POWER. Meanwhile, the DOE has only completed enough design work to satisfy the safety analysis, which means that even if the NRC licenses construction, design work that will result in blueprints still needs to be completed, another official said. 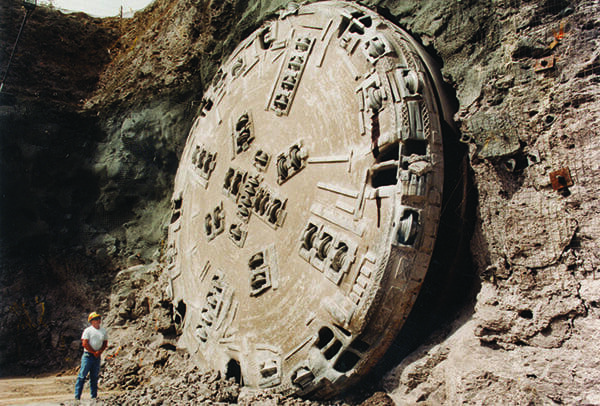 More funds will then be needed for actual construction of the repository—including excavation, surface handling facilities, and an underground railroad—as well as related external infrastructure, including a railroad, which the DOE has deemed the preferred method of getting spent fuel from reactor sites to Yucca Mountain. At the NRC, meanwhile, similar troubles bar it from taking the next crucial step to schedule an adjuratory hearing before it issues a licensing decision. Even though the entity is eligible to use the $40 billion Nuclear Waste Fund, any money it gets must be approved by Congress. In February, the NRC requested $48 million for its review of the Yucca Mountain application for FY2019. The NRC last received $10 million from the fund for work related to the closure of Yucca Mountain licensing support activities in FY2011—eight years ago— which was only 34% of what it received in FY2010 ($29 million) and 20% of what it received in FY2009 ($49 million). Despite its funding challenges, however, the NRC has made some notable progress. In October 2014, the regulatory body’s staff completed Volume 3 of the Safety Evaluation Report (SER), finding that the Yucca Mountain site would meet NRC standards after being permanently sealed. However, upon issuance of the complete five-volume SER in January 2015, NRC staff recommended that construction of the repository shouldn’t be authorized until all land and water rights requirements were met, and the NRC completes an environmental impact statement (EIS) supplement for the project. As required, the NRC completed the EIS statement in May 2016. Rep. Shimkus’s June 2017–introduced HR 3053, meanwhile, seeks to withdraw the Yucca Mountain site from other uses under the public lands law, effectively satisfying the other licensing condition. However, the bill remains stalled on the calendar, even though it cleared the House Committee on Energy and Commerce in October. Beyond funding, and perhaps as insurmountable, are a host challenges concerning public opposition. Nevada, for one, seems unwilling to soften its formidable opposition to Yucca Mountain. The state’s governor, Brian Sandoval (R), has vowed to oppose Yucca Mountain “in any form.” Even though rural counties (including Nye County, where the project would be located) support the project, the state has filed 218 challenges to the DOE’s license application, and even denied a federal government water permit. Yet another latent factor that could derail the entire process rests on whether the D.C. Circuit will uphold the legality of public and health standards set in 2008 by the Environmental Protection Agency (EPA) for radioactive materials stored at Yucca Mountain, as required by the Energy Policy Act of 1992, but which have been legally challenged by Nevada. The case has been in abeyance pending resumption of the NRC’s licensing process, but its significance cannot be understated: Because the SER is premised on the EPA’s standards, if they were to be struck down by a court in the future, conclusions in the SER could be thrown into jeopardy—and that could force the NRC to start the process afresh. Meanwhile, political opposition, which has paralyzed policy for decades, continues. As Sen. Edward Markey (D-Mass. ), a member of the Senate Environment and Public Works Committee, explained to POWER in a concise statement: “Restarting the licensing process for Yucca Mountain would reach new heights of scientific irresponsibility.” While the senator did not comment on a long-term waste management effort, his spokesperson noted that in May 2017, Markey sponsored the Dry Cask Storage Act, a bill that would essentially allow the NRC to give nuclear generators grants from interest earned from the Nuclear Waste Fund to transfer SNF from pools to dry storage under NRC-approved plans. Finally, opposition is bolstered by a variety of stakeholders who just aren’t convinced that Yucca Mountain is the answer, among them, citizen, environmental groups, and think tanks. An example is the Union of Concerned Scientists, a group that says it is neither pro- nor anti-nuclear power but has served as nuclear power and safety watchdog for 50 years. Last fall, the group told lawmakers that a nuclear waste policy should focus on a consent-based approach, rather than one focused on Yucca Mountain, that is “technically sound” and requires that SNF is managed safely and securely at reactor sites until a repository becomes available. Assuming Yucca Mountain development is stonewalled for now, and with identification of a new geological repository suspended in 2017, only two other options are legally afforded by the NWPA. One possibility is to construct one or more interim storage facilities to consolidate SNF in willing host communities to which the DOE could move SNF until a long-term geological SNF storage facility opens. The other is to utilize federal monitored retrievable storage (MRS) facilities, in which the DOE could store nuclear waste from commercial nuclear plants pending permanent disposal or reprocessing. Despite the DOE’s attempts in the late 1980s to persuade states to host an MRS facility, no MRS facilities have been proposed. Meanwhile, two private companies have expressed interest in developing private consolidated interim waste storage sites. In April 2016, waste management company Waste Control Specialists (WCS) filed an application for a NRC license to build an interim SNF storage facility as early as 2022 at a 14,000-acre site near Andrews, Texas, where the company currently operates two low-level radioactive waste storage facilities with local support. However, the company asked the NRC to suspend consideration of the application a year later, citing estimated licensing costs that were “significantly higher than we originally estimated.” WCS didn’t immediately respond to POWER’s questions about the status of its application. SNF storage system maker Holtec International, which filed an NRC application (Figure 4) in March 2017 for a facility to be located on land provided by a local government consortium near the Waste Isolation Pilot Plant in New Mexico, also declined to comment on the projects’ costs and timeline or the status of the application. (In early March 2018, the NRC initiated review of Holtec’s license application, suggesting the review process could be wrapped up by July 2020 at a cost of $7.5 million). Meanwhile, while the DOE recognizes the NWPA’s authorization of interim storage, the law requires that progress of an MRS must be linked to progress of Yucca Mountain, an agency official pointed out. “So, under current law, there’s one solution, and its Yucca Mountain,” the DOE official said. From a technical perspective, beyond deep geologic disposal, the only plausible alternatives for permanent nuclear waste management are permanent surface storage or reprocessing, Peter Swift, senior scientist at Sandia National Laboratories, told POWER. “Permanent surface storage could work in principle, but it’s not a realistic option. Meeting the same regulatory requirements for isolation that are applied to deep geologic repositories would entail an open-ended commitment to maintain secure surface facilities for one million years and could require repackaging SNF perhaps as frequently as every 100 years,” he said. Meanwhile, reprocessing SNF to generate new reactor fuel is a proven technology, but it has never been shown to be economically attractive in the U.S, Swift noted. “The U.S. has no capability at this time to process SNF on a commercial scale, nor is it credible to imagine near-term construction of facilities that could reprocess the large quantity of existing SNF,” he said. “Alternatively, in my opinion, if the U.S. does not build a new generation of reactors, there will be no market for fuel from reprocessing, and it would make no sense to incur the expense of creating it. As an additional point, all reprocessing technologies generate high-level radioactive wastes that will require deep geologic disposal themselves: reprocessing does not remove the need for geologic disposal of radioactive wastes,” he said.